Customer Relationship Management (CRM) software that is fully-integrated into a firm’s infrastructure can be an incredibly powerful tool. It is just one of a wide array of financial technology (fintech) tools that have been engaged in a technological arms race for advisors trying to stay abreast of their competition as well as the expectations of increasingly tech-savvy clients. With the advisory business now encompassing increasingly complex investment and relationship management functions, many advisors are finding that simple contact management software no longer suffices to manage their businesses – a comprehensive solution is needed to stay on top of their evolving practices. In this post, we review two top CRMs: the current market leader in the RIA segment, Redtail CRM, and a new offering from Salesforce, the world’s largest provider of CRM solutions, called Financial Services Cloud (SFSC). According to a survey by InvestmentNews, Salesforce has just under 13% of the advisor market, but this is generic Salesforce with customized overlays, not SFSC. Redtail CRM dominates the space with a 40% advisor market share. However, many advisors will quickly migrate to SFSC and it has gotten off to an especially strong start among RIAs managing significant amounts of assets. 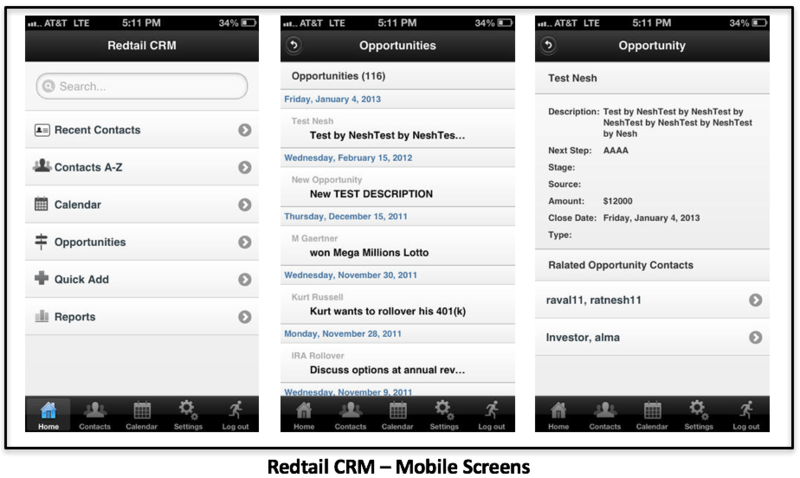 A review of Redtail CRM quickly demonstrates how the program has become so popular with financial advisors. The solution’s layout is intuitive and it is easy to add notes, tasks, assets, and clients. However, from a design standpoint, the user interface lags behind some newer offerings in the field, especially SFSC, which makes it looks old and clunky by comparison. An attempt to revamp their interface was made by the company in January of 2015 with the humorously-named ‘Tailwag’ release. Unfortunately, the update came with an unusually large number of bugs which generated an avalanche of customer complaints. While most have been resolved by this point, the experience may discourage the company from proposing further dramatic changes to the UI anytime soon. Redtail’s dashboard is designed with tabs at the top and to the left for navigating to other sections of the software. The tabs connect to Contacts, Calendar, Market News, Reminders, Opportunities, Social, Reminders, Accounts, and Workflows. There is also a listing of upcoming activities and recently added notes, which should make the dashboard an advisor’s most visited location. Redtail’s Workflows section offers advisors an efficient way to track multi-step processes. As the advisory business becomes more complex, between regulatory issues such as the DOL’s fiduciary rule and client expectations of technologically advanced services, being able to stay on top of all the issues needing attention has become increasingly challenging. This makes the Workflows section a crucial part of any CRM solution. Advisors can assign tasks to different staff members, while establishing due dates for each step of the process. Multiple tasks can be assigned for each workflow item. As each step is finished, it can be marked complete to show progress. Workflows can be exported if necessary. The ability to include separate checklists in each workflow helps to accommodate tracking of complex tasks. For example, if you are readying your office for a regulatory review, there may be an extensive series of tasks that your staff must perform to prepare for the review. As each task is performed the solution keeps track of its completion, while providing upcoming deadlines for the next steps. The workflow section is a strength of the software, enabling advisors to efficiently keep track of all their ongoing tasks. The workflow is not quite as well-integrated with the rest of the solution as might be the case with a newer generation solution like SFSC, but nevertheless gets the job done when it comes to providing advisors with a means of staying on top of their to-dos. Many other report types can be run. The reports offered cover a broad range of useful areas, but the report interface design is not as intuitive as SFSC’s new generation offering, which provides summary info along with each report heading. Redtail CRM has built out a wide range of integration options, which allow data to be imported from and exported to many popular financial solutions. The overwhelming number of integrations sets it apart from its competitors. 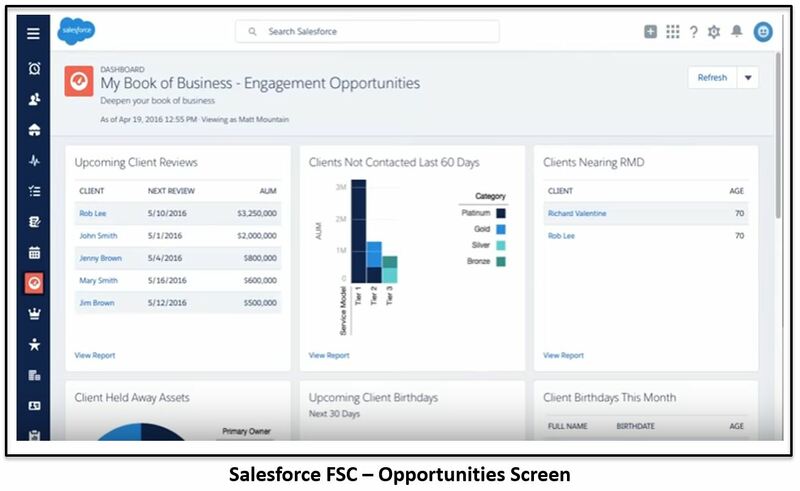 Salesforce FSC doesn’t offer the same number of integration opportunities, especially around financial planning software. 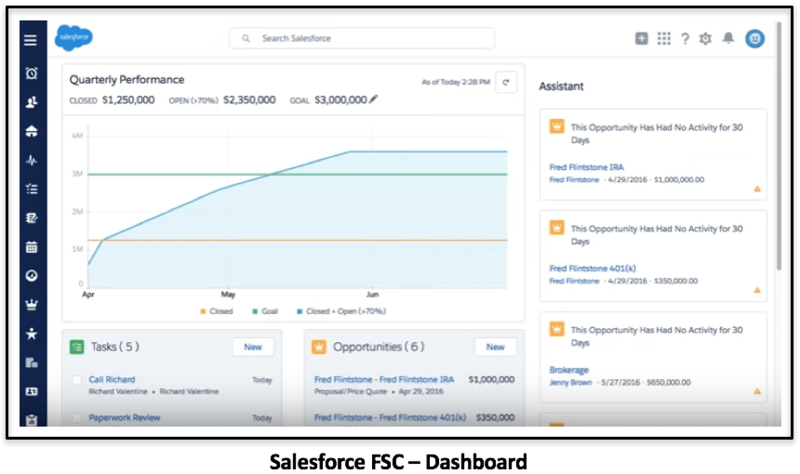 SFSC advisors can access the AppExchange to link up with a number of financial apps, but leading financial planning offerings available to integration with Redtail CRM such as MoneyGuidePro and eMoney are not available there. With many advisors using these programs both to help manage customer financial goals and to directly interface with them, this linkage is a feature that appeals to advisors looking to seamlessly integrate their usage of CRM and financial planning applications. 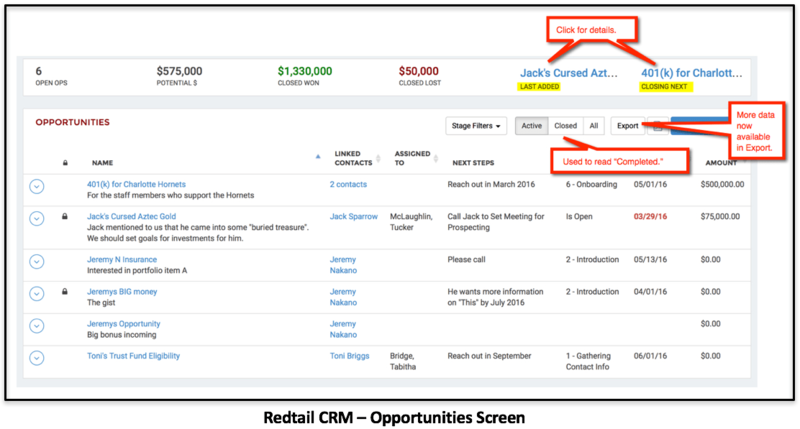 The Redtail CRM Opportunity section provides a convenient way to add and track opportunities with both existing and prospective clients. This module allows advisors to follow prospective business opportunities until they are completed, as well as track the dollar amount of closed and outstanding opportunities. Prospecting is a key function of any advisory business. With the trend towards fee-based business accelerated by the DOL Fiduciary Rule, the sales cycle has become more complex. Today, rather than selling products (such as hot IPOs), advisors must effectively sell themselves and their firm. Accomplishing this often requires a longer sales cycle than would be the case with traditional transaction-based business, complete with more detailed presentations about the services an advisor offers. A comprehensive CRM solution is essential to managing this process. The Opportunity section enables an advisor to assign new business to different team members and establish multiple stages for each one. Besides facilitating delegating responsibility, this feature enables customers to get to know other members of an advisor’s team. This is an important part of the nurturing process which is so vital to closing business in this “high-touch” era of advisory services, where clients expect to hear from their advisors or their staff on a regular basis, both before and after hiring them. This section is a definite strength of the solution. SFSC has comparable functionality, with both solutions doing a good job of allowing advisors to keep close tabs on business opportunities. Pricing starts at $99/month for up to 15 users, which makes Redtail CRM one of the lowest cost offerings in this space. Redtail comes in with an overall score of 30.0 out of 35.0. Their user experience number went down a bit when compared to SFSC due to the latter’s newer-looking and more intuitive interface. We also dinged them on workflows since we felt it could be better integrated with the rest of the application. Overall, Redtail CRM offers robust functionality in a functional, streamlined package. From scanning your calendar to posting on social media, checking workflows, or looking for opportunities for new business, the software offers a comprehensive method for advisors to manage their business. Continuing our CRM software comparison is Salesforce Financial Services Cloud (SFSC), which was just released to the public in March 2016. According to Rohit Mahna, general manager of financial services at Salesforce, SFSC was built to solve “big, complex, industry problems” across banking, wealth management and insurance. While advisors in these segments do not have the same needs as RIAs, Salesforce believes that SFSC can also be a solution for the independent space. SFSC clearly benefits from its parent company’s position as the top general purpose CRMs out there. The solution’s overall design is a cut above most, if not all, of the other applications we’ve seen. SFSC has all the critical functionality including contacts, accounts, transactions, activities, etc., along with notes in each section. Especially helpful is the home page design, which provides a bird’s eye view of the advisor’s important tasks compiled from the leads and opportunities sections. SFSC allows for remote team collaboration as well as seamless mobile use. As good as the SFSC interface is, there can be some extra work involved in setting up the application on your system. If your team doesn’t have a dedicated IT specialist, outside assistance may be required to provision the solution for optimal performance. This is a powerful, comprehensive solution and as a result it can take some time and practice to become familiar with everything the program can do. The overall structure of the application is well-designed, so navigating is relatively easy, even for new users of the software. While the Redtail CRM UI is certainly functional, as attested by its wide popularity among advisors, SFSC clearly has the advantage of being a next generation application – its display offers another level of convenience and customizability. Its dashboarding functionality is a step above Redtail’s offering, as are its handy reminder messages, which quickly and efficiently notify advisors of all their pending tasks. Various activities can be assigned or performed in different sections such as contacts and opportunities. The workflow created by these tasks is reflected either on the advisor home page or in the specific sections where it has been assigned. Similar to Redtail CRM, SFSC allows different duties to be assigned to different team members, and collaboration among team members performing various tasks is efficiently accommodated. The Assistant section on the homepage proactively informs the advisor of any activities that need follow-up to be completed or opportunities that have not been acted upon. Also on the homepage separate sections for Tasks, Opportunities, and Leads allow you to easily track and make changes to your most important workflows. 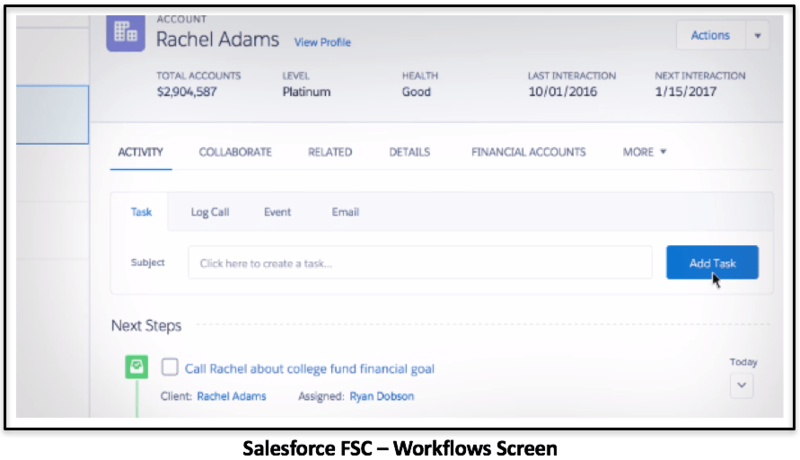 Workflow processes in SFSC compare favorably to Redtail CRM. Both products handle this well, but SFCS’s well-placed workflow reminders and easier-to-follow interface gives it a slight edge in this area. The Tasks section is a helpful way to view all the outstanding items that require attention. Simply clicking on a task opens a task details box on the right of the screen. For busy advisors who find it difficult to keep track of all of their meetings, events, calls, and miscellaneous to-dos, this section is a big help. While dashboard displays and a number of other views can be customized, the core workflows of the software come enabled out of the box, allowing users to start managing their workflow with the system right from the get-go. The intuitiveness and ease of use of the various workflows in the solution go a long way to explaining its popularity with advisors. Salesforce products are well-known for their emphasis on the customer experience, and SFSC is no exception in this regard. Reporting is a strong point of the solution. Advisors can view clients and accounts in a variety of different contexts, and customize client and household report views to fit their preferences. Client goal reports provide a handy visual context to help advisors identify any action needed to help their clients meet their objectives. Pre-established reports such as “Clients not Contacted in the Last 60 Days” or “Client opportunities past Close Date,” to name just a couple, offer advisors the ability to quickly pull up relevant information. SFSC’s important activities and actionable opportunity reporting is also well done, allowing advisors to easily keep track of upcoming events related to their business. 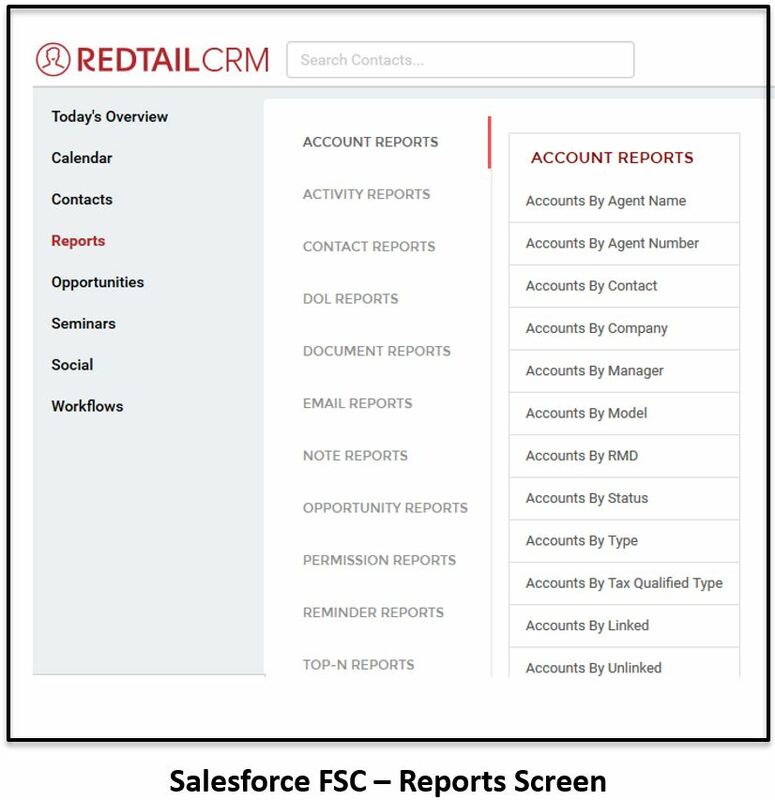 While Redtail CRM also has robust reporting functionality, it falls short of SFSC in this area in terms of reports’ interface design and the number of convenient prepackaged reports available for advisors to access. Salesforce has utilized partnerships with leading financial industry technology companies including Accenture, Informatica and Envestnet/Yodlee to offer a wealth of data sharing opportunities through the solution’s infrastructure. This allows advisors to benefit from the ability to link their SFSC client accounts with a wide variety of outside data sources. Yodlee offers account integration from over 15,000 global financial sources, while Informatica is a world leader in bringing in data from a wide variety of news and financial reporting sources such as Bloomberg and Thomson Reuters. Implementation services are offered by consulting firms such as Accenture, Capgemini, Deloitte, NexGen Consultants and more for those advisors looking to have the solution customized to meet their firm’s specific needs. SFSC features Orion’s billing service, which allows users to manage their billing, paying, and reporting services seamlessly within the solution. Portfolio rebalancing services are included within the product by Advisor Software’s rules-based rebalancing engine, which can monitor and rebalance accounts at both the household and individual account level. Advisors looking for additional prospecting resources can use the Idio and Wealth Engine extended client acquisition capabilities that come with the software. These include wealth scoring and analytics to help advisors increase their books of business. All in all, the integrations included with or available through SFSC are extensive and impressive. In addition, the Salesforce AppExchange provides hundreds of financial apps that can be used to extend the reach of the software further. Without a doubt, the many integration sources available through the product are a selling point in its favor. SFSC provides robust tracking functionality when it comes to following up on leads and opportunities to do new business with existing clients. An activities list detailing all such events can be created, or reminders can be found when looking at individual client or lead details. The opportunities section provides a convenient method for identifying where to focus to generate more business from existing clients. The solution allows an advisor to follow an opportunity all the way from start to finish, and easily distinguish prospect opportunities from client opportunities. Another strength of the application is its ability to search an advisor’s existing book of business and identify opportunities to do more business with current clients. SFSC has robust mobile functionality. A variety of reports and notifications can be accessed remotely on a smart phone or tablet when an advisor is out of the office, helping enhance advisor efficiency. Per seat license fee: $150 monthly; $1,800 yearly. Discounts may apply depending on broker dealer or custodian affiliation. SFSC scored a respectable 31.0 out of 35.0, a full point higher than Redtail CRM. However, the difference in cost reduced SFSC by 1.5. If we remove cost from the equation, the scores would be 27.5 to 25.0, which is a 2.5 difference. Redtail CRM and Salesforce Financial Services Cloud are both top notch products. Neither one is perfect – each has its strengths and weaknesses. From the standpoint of price, Redtail CRM is hard to beat, given its very low price point and generally strong functionality. We would recommend it for smaller RIAs that do not have more than 20 employees. SFSC is the preferred solution for larger firms, especially banks and broker-dealers who are less concerned with saving a few bucks and need the enterprise features, rich user experience, extensive customization options, custom programming and bazillion offerings in the AppExchange. SFSC’s popularity among advisors with higher AUM attests to its value among customers who are more focused on performance. SFSC should continue to gain market share, in spite of its much higher cost and more complex implementation. 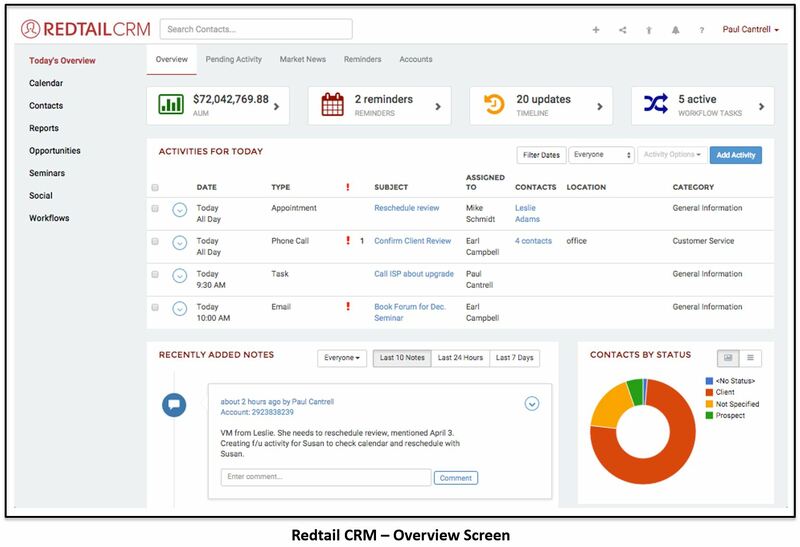 While Redtail CRM’s UI lacks the polish of SFSC’s offering, it is still quite efficient at delivering the information advisors need to run their business. This should be enough to retain its commanding market share lead in the face of competition from SFSC and other next generation solutions.